ACZ nano Extra Strength is the only nano zeolite formula available with over 90% of ACZ nano crystals existing within the nano range as calculated via SEM analysis. Nano technology scientists have discovered the remarkable fact that by making product ingredient particles extremely small that chemical reactivity and thus product performance is dramatically enhanced. It can be shown mathematically that with equal quantities (weight) of nanometer-sized particles (one-billionth of a meter size) versus micron-sized particles (one millionth of a meter size) that the nanometer-sized particles will exhibit an active surface area increase of about one million times over the exposed active surface area of the larger micron particles. Competing liquid and powdered zeolite formulations utilize micronized zeolite, with particles over one thousand times larger than the nano zeolite crystals provided in ACZ nano Extra Strength. In other words, ACZ nano Extra Strength provides around 1,000 nano zeolite particles for every single micronized zeolite particle provided in competing liquid and powdered zeolite products. 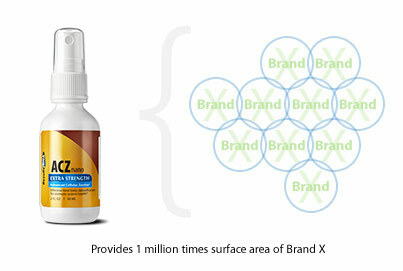 An unparalleled adsorbent, ACZ nano Extra Strength exhibits a one million times increase in actual surface area per equal amounts of zeolite administered, delivering far superior results. In a recent New York Times article (published November 7, 2007) titled: "Aiding the Environment, a Nanostep at a Time", author Barnaby J. Feder in his comments describing the importance of having effectively large surface areas on the active ingredients of products stated: "Six ounces of nanoscale particles does the job of one ton of micron-size particles because of their vastly increased surface area and the greater ease with which they move?" Combining nano zeolite and wetter water technology, ACZ nano Extra Strength provides the highest cation exchange (toxin uptake and elimination potential) by providing an exponentially higher number of super cleansed, nano zeolite crystals infused into wetter-water?, enabling a more rapid penetration and systemic detoxification of all physiological systems. Thus your body cleanses more and works less.